This prestigious 20+acre ranch offers a peaceful country setting with all the city conveniences. This massive estate features 3,488 sqft. 2-story home w/huge front porch. Enjoy the spacious 3 bedroom, 2 bath home with a home office that can be converted into a 4th bedroom, if needed. This home enjoys a true single story split floor plan. Surrounded by massive oak trees & a commercial grade private electric entry gate with brick columns, this property gives you the privacy and seclusion you have been looking for. Included are 7 fenced pastures each w/water, a 6 stall barn w/tack room with plenty of room to add more, wash bay, 1500Sqft. metal storage building wired for 220v & hay room. As you walk through the double door entry into the foyer you will enjoy stunning hardwood floors & cathedral ceilings. The kitchen, featuring a Wolf sub-zero refrigerator, built-in wine cooler, stainless steel appliances, double wall ovens, tasteful granite countertops & backsplash, plenty of elegant cabinetry & breakfast bar that would excite even the most formidable of home chef's. The adjacent great room features a wood burning fireplace and French doors that lead to the paved, covered and screened lanai w/salt water pool w/sun shelf. Enjoy the Florida lifestyle at its best on your over 2,700 sqft. private patio, screened lanai, huge pool deep enough for diving & outdoor kitchen. The master bedroom suite boasts French doors leading to the pool retreat, tall custom closets, granite countertops, upgraded dual sink vanity, new ceramic tile, relaxing garden tub, separate companion shower with dual showerheads and convenient sitting bench. The upstairs offers an enormous bonus room with room for a pool table and an oasis for a game room or entertainment mecca. This home also features a central vacuum system, a new culligan salt filtration system, and the kids will enjoy the treehouse modeled after the Swiss Family Robinson Treehouse at Disney's Magic Kingdom featuring a suspension bridge. 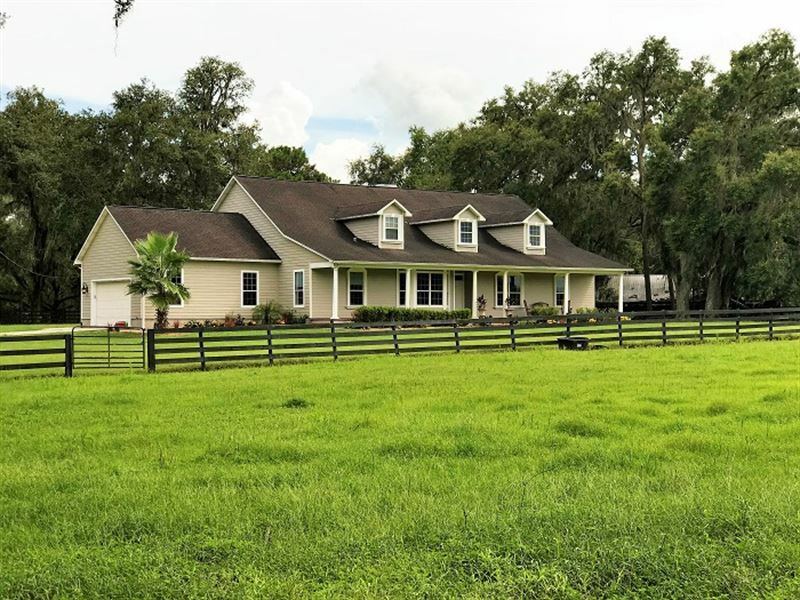 Beautiful scenic landscape, close to major roads that connect you to shopping, entertainment, hospitals & beaches, yet far enough away to enjoy the private Dade City / Brooksville countryside. Less than 10 minutes to I-75. Properties like this don't come around very often, so act today as this will not last long.